According to Hudson's handy dandy Virtual Console page, the best of Bonk's three outings on the TurboGrafx-16 (Bonk's Revenge) will be available for purchase and download on Monday. 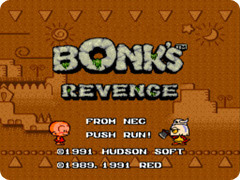 Bonk's Revenge was one of my favorite titles on the TG-16 back in the day. It was better than the original in practically every way--it bests Bonk's Adventure in graphics, audio and gameplay. Now Hudson just needs to release the previously unavailable (in the U.S.) Battle Lode Runner. Maybe next week?